Chickenpox is a common childhood illness caused by a virus. 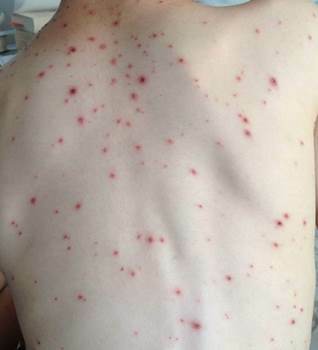 Children with chickenpox need to stay home from school and daycare. Children can now have free chickenpox immunisation. Chickenpox is a viral illness. The chickenpox virus is also called varicella virus or varicella zoster virus. It is the same virus that can cause shingles, which usually occurs later in life. Who is at risk of getting chickenpox? You are at risk of getting chickenpox if you have never had chickenpox and haven't had the chickenpox vaccine. Chickenpox is more common in children between the ages of 2 and 10 years. If one child in your household gets it, it is almost certain that any others who have never had chickenpox will get it next. A red rash follows 1 to 2 days later. It usually starts on the face and scalp, spreads to the chest, back and tummy and then to the arms and legs. It can also appear inside the ears, on the eyelids, inside the nose and mouth, and even around the genital area. The rash continues to spread for 3 or 4 days. It usually becomes very itchy. Within a few hours after each spot appears, a blister forms. It may appear full of yellow fluid. After a day or so, the fluid turns cloudy. The blisters release liquid containing the virus, then form crusts or scabs that fall off after 1 to 2 weeks. The spots heal at different stages, some faster than others, so your child may have the rash in several different stages at once. Some children have mild chickenpox with under 50 spots. Others have a miserable time with hundreds of spots. Chickenpox is very easy to catch (it's highly contagious). The chickenpox virus spreads through the air (by coughing and sneezing) and by direct contact with mucus, saliva, or liquid from blisters. You can catch the chickenpox virus from touching clothing or other objects that have the blister liquid on them. The incubation period is the time from when your child comes into contact with a person with chickenpox, to when the first symptoms appear. The incubation period for chickenpox is usually 14 to 16 days but can range from 10 to 21 days. A child is infectious 1-2 days before they get the rash until all the blisters have dried up. This usually takes 5 to 7 days. Should my child with chickenpox stay home? Children should stay away from daycare or school, and public places, while they are infectious. Once scabs form on all the spots, your child is no longer infectious. They may go back to school when the spots are all scabbed over and dry. This can take around 5-7 days. How do I care for my child with chickenpox at home? For many years, people have used calamine lotion to help with the itch from chickenpox and found it may relieve itching. There's really no clear evidence around its use. Calamine is generally considered to be safe although some suggest it may dry the skin too much. If your child with chickenpox also has eczema, and the above steps are not controlling the itching, you might like to speak to a health professional for advice. Can I use medicines to relieve chickenpox symptoms? If your child is miserable because of a fever, headache or other aches and pains, you can give paracetamol to make them more comfortable. You must follow the dosage instructions on the bottle. It is dangerous to give more than the recommended dose. 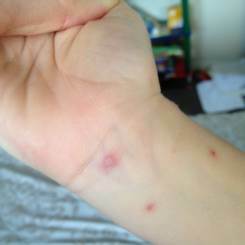 Are there likely to be complications from chickenpox? In the majority of children, chickenpox is a mild illness and they get better completely. 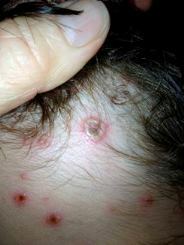 Sometimes, scarring from the spots can occur. There can sometimes be complications which require a hospital stay or intensive care. The most common complication is a secondary skin infection. Around 1 in 20 healthy children develop a bacterial skin infection which needs treatment with antibiotic medicine. Bacterial skin infections can lead to bacterial infection in other parts of the body, including pneumonia and bloodstream infection (septicaemia). On 1 July 2017, chickenpox immunisation was added to the National Immunisation Schedule - the series of vaccines that are offered free to babies, children and adolescents, and adults. That means your child can have chickenpox immunisation at 15 months of age, together with their other vaccines. Most people who have this vaccine will not get chickenpox. If an immunised person does get chickenpox, it is usually mild. Your child can also have free chickenpox immunisation if they turn 11 years of age on or after 1 July 2017, if they haven't already had chickenpox or chickenpox immunisation. Certain high-risk people will still be able to get the vaccine free regardless of their age. Talk to your family doctor or practice nurse. For more information about chickenpox immunisation, see a fact sheet from the Immunisation Advisory Centre (IMAC) (PDF, 147KB). This leaflet about chickenpox is for parents of babies and young children. It explains how immunisation can protect your family from chickenpox. It is also available in Māori. The section on chickenpox in the Ministry of Health's handbook provides detailed information for health professionals and may be of interest to those parents who want more comprehensive information. See information about chickenpox, including a fact sheet on chickenpox for (PDF 147KB). The fact sheet provides more detailed information about the chickenpox vaccine (for example, 'What vaccines protect against chickenpox? ', 'How safe are the vaccines? ', 'How protective are the vaccines?' etc). Call free on 0800 IMMUNE (0800 466863). A brief video from the Immunisation Advisory Centre describing the impact of chickenpox (varicella) and the vaccine that helps protect against it. This page last reviewed 19 September 2017.